It's not just food you have to think about when planning a kids' birthday party! When your child's birthday rolls round, a celebration is in order! Whether you decide on a small get-together or a huge extravaganza, there are loads of activities and ideas for kids' birthday parties to choose from. Don't wait until the last minute - get planning today! This video will give you ideas to delight your kids and their friends. These children are sure having a great time at their party! Which party activities are suitable for your kids? Is your child loud and full of energy? Energetic kids might enjoy a jumping castle or a dance party, both of which make great kids activities. Quieter kids might prefer a petting zoo or a performance from a troupe of visiting clowns or magicians. There are so many different options for kids' birthday parties - pirates parties, hired entertainers, and even arts and crafts. Think about what your child is into, and go from there! Family bonding - sharing the fun of a birthday party can bring the family together and build lasting memories. Making friends - if the guests have a good time it can help your child build relationships with his/her classmates. Boost Self-esteem - being the centre of attention will make your child feel special and could help increase their confidence. Education - some parties have an educational element such as cooking parties and science parties. Is your child the shy, retiring type? Kids' birthday parties can be overwhelming. If your kid prefers to avoid the limelight you might want to try a low key backyard gathering with a few close friends and some simple party games. Very young children can struggle with loud, busy parties so it's probably best to wait until your child is primary school-age before whipping out the costumes and hiring a circus. 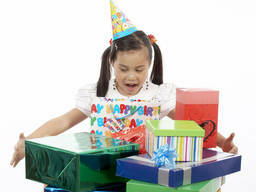 Organise your kids' birthday parties activities! Not sure if a party is within your budget? Your child's special day can be as cheap as baking a cake, buying a few drinks, and arranging some free or inexpensive party games. If you feel like spending more, kids' entertainers usually cost around $250 per hour, and jumping castles are around $200 for 4 hours. Venue - indoor or outdoor? Food - do any little guests have allergies or food intolerances? Invitations - give your guests' parents plenty of time to RSVP! Party supplies/decorations - to get everyone in the party mood! With a little bit of creativity, your kids' birthday party could be so much fun they'll remember it forever!